After the bus ride from the airport we got into our room to find it was missing the pack n play we requested. Our plan was for Luke to take a nap before we ventured out but without a proper bed there was a slim chance for that to happen. So we forged on into the abyss and hopped on the bus to the Magic Kingdom with a boy that was up since 4:00 a.m. 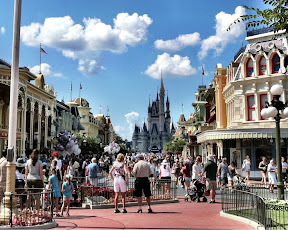 Whether it was luck or magic we saw Princess Cinderella, Mickey, and the gang first thing. 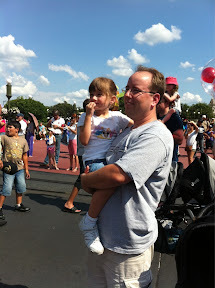 Right in front of the Enchanted Castle a show was just starting titled "Dreams Do Come True". It had dancing and signing and everything a little girl in love with princess could want. Following the show we headed behind the castle for some rides. 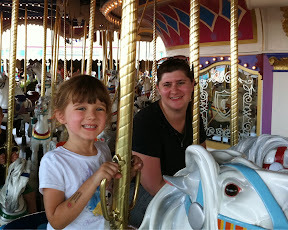 Our first ride and the one with the shortest line was It's a Small World. Showing my exhaustion I just about fell asleep on the ride. Those little happy singing dancing kids are hypnotic. 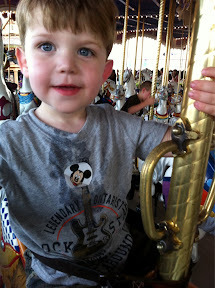 Following that we took a few trips on Prince Charming's Carousel. This is when Luke finally broke down. Just getting him off the horse would evoke screams. Part of you would get frustrated with him and the other would feel sorry for the guy. 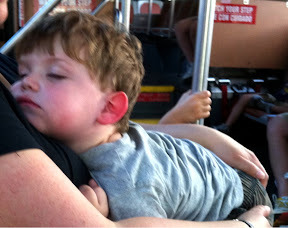 We called it a day and on the bus back Luke fell asleep on Mom. After the bus ride he slept through dinner in our stroller. This was a welcome relief because we didn't really have a clue on how we were going to feed ourselves. By him sleeping through Mom and I had an enjoyable quiet dinner. Showing how old we are getting. Mom and I ate roast turkey, potatoes, and broccoli instead of burgers and fries for dinner. After dinner we headed back to the room to call it an early night. However our pack n play was still not yet delivered! One angry call and 20 minutes later we were in business and asleep by 9:30.